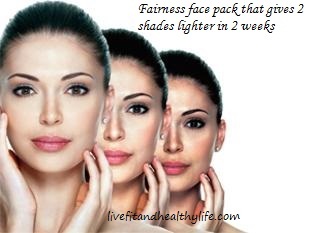 Age old remedy to get fairness for your face. Try this for a couple of weeks to get best result. Method: Take two table spoons of milk in a bowl and add it one half table spoon of lemon juice, half table spoon of turmeric and two table spoons of gram flour. Mix all the ingredient well and dab it on your face, Leave it for 15 minutes until it becomes dry. Now rinse off your face with plain water and pat with a cotton cloth.